Generally speaking, there are precious few "rules" when it comes to decorating. After all, taste isn't really a matter of following a prescribed list of "do's" and "don'ts", but instead a more elusive art form: it is emotional rather than logical. There's an often repeated mantra that good taste can't be taught -- and perhaps that is in fact the case. However,I firmly believe that if we take the time to train our eyes, we can learn short cuts and handy tricks that can at the very least help us approximate good taste, even if it isn't innate. 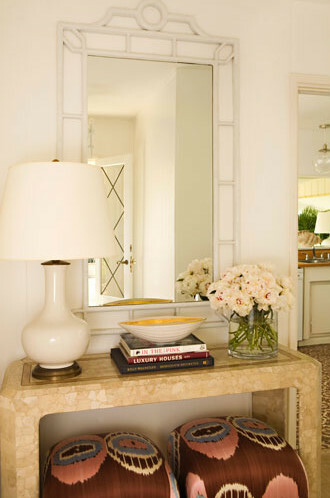 One area of decorating that appears to have surprising uniformity is styling a console table. A console table is the true workhorse of occasional tables -- it works equally well behind a sofa as it does in foyer -- and it's also an amazing opportunity to practice styling on a small scale. For many designers, the task can even be broken down into a rather simple arithmetic formula. 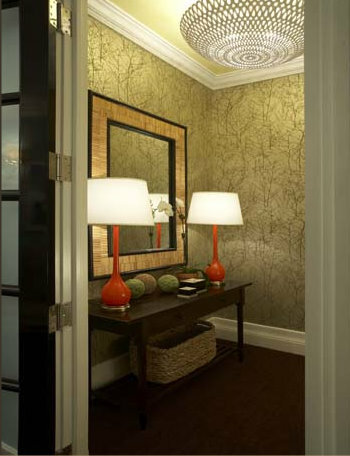 Take for example Sara Gilbane's alcove (shown above). 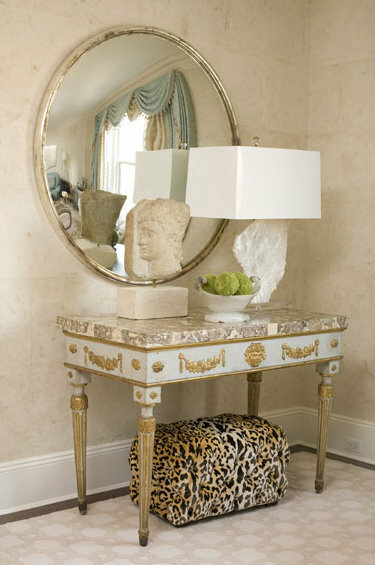 The classical elegance of the console table is anchors the statement-making gilt mirror. A pair of tall vases flank either end of the table and help bridge the space between the mirror and table top. Smaller-scaled picture frames and a decorative bowl fill in the center of the table and create further symmetry. This symmetrical arrangement is then echoed on the lower shelf with two small plants flanking the inlaid box. 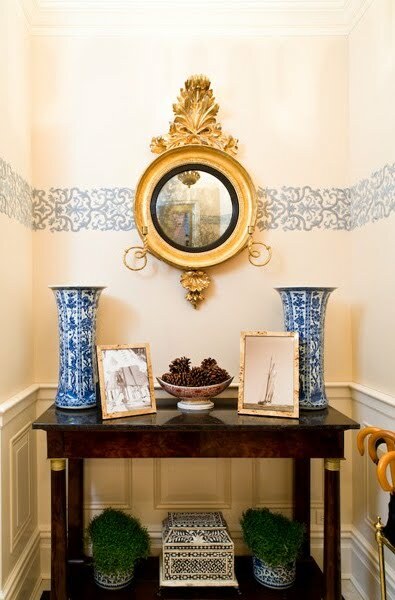 If you have a longer wall to fill, follow the lead of Miles Redd (above) and Sally Steponkus (below) and try flanking the console table with a pair of smaller chairs. When company comes, you'll have the extra seating, but otherwise the chairs will be out of the way for day-to-day activities. If you're ready to move on to the next level, try breaking up the symmetry a bit, which can create a far more interesting (and less "decorated") look. The key to your success though will be to maintain the balance. 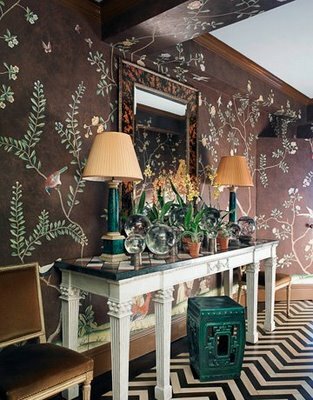 Here, Kristen Hutchins uses only one table lamp (a good choice as the console table is on the small side), but balances it with a small floral arrangement at the other end. Here, the very symmetrical arrangement of mirrors above the console is loosened up by the more haphazardly arranged orange boxes below. If the boxes had been stacked more tidily, the overall effect would have been far too geometric, which would have felt too studied and not in keeping with the more organic qualities of the decorative objects on the table itself. 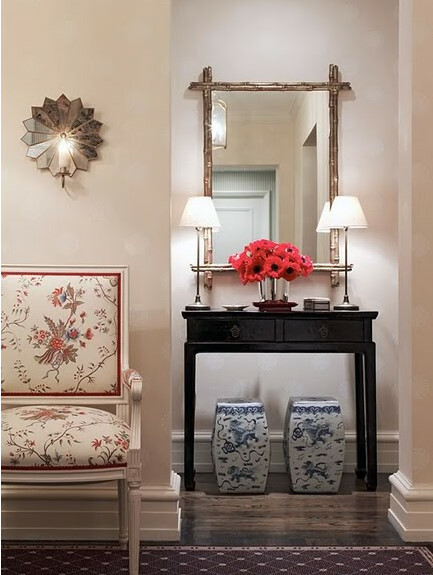 Sometimes a simpler, less cluttered arrangement is best, particularly in a small entryway or hallway. 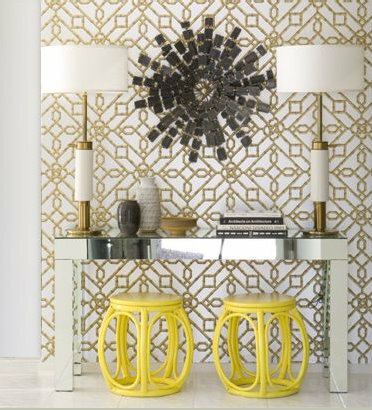 Here, Lindsey puts the emphasis on the vertical space of the room rather than the horizontal by using highly reflective elements (the metallic wall paint, the gilt mirror, the glittering wall sconces). 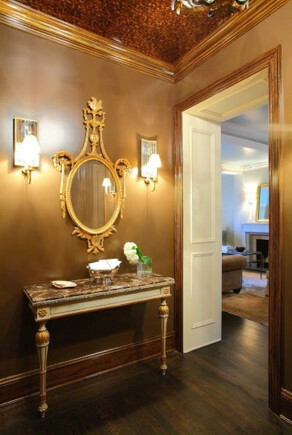 The effect is further realized by placing the mirror and sconces higher up on the wall. A word to the wise though: when hanging wall art, mirrors, sconces, etc. it's best to keep them below the height of the door or window frame. Time for the masters' class! 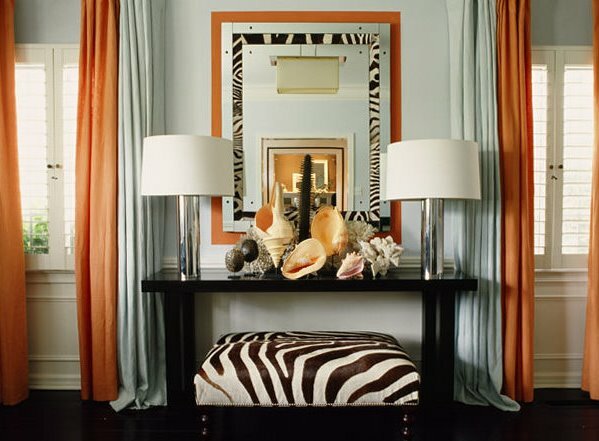 In this vignette by Tim Clark, nothing is symmetrical and yet the arrangement is still highly successful. 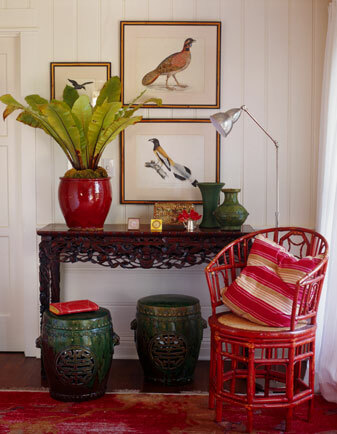 The red rattan chair is balanced by the palm in the red pot and the height of the pot is similar to the height of the floor lamp behind the chair. 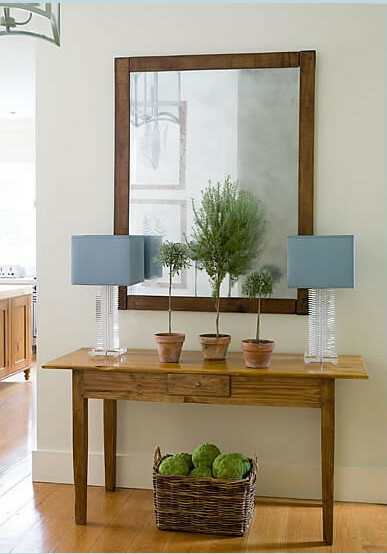 The green stools echo the color and shape of the small vases on the opposite side of the console table. As each side speaks to the other, the eye moves back and forth across the vignette. A final point to consider is that sometimes fewer, larger pieces are far more effective than a bunch of small tchotchkes. 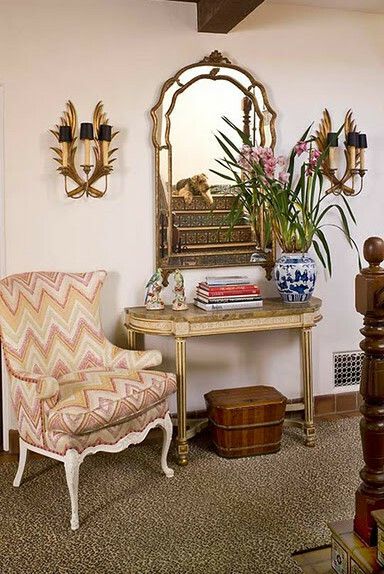 In this vignette by Amanda Nisbet, the scale of the mirror, lamp and bust create a lot of drama without creating a lot of visual clutter. The neutral palette also ensures that these disparate pieces work harmoniously together. What an excellent post. I think that styling is indeed an art, and I love how you've broken it down here for us. I've been dying for a console table for years now (sad, I know), but I don't really have the right space for one. I've got some ideas on how to make room, but I'm not sure how it would go. Hmm, I'm sensing a weekend project of rearranging furniture!!! Great post and perfect timing. I already had plans to move a console from upstairs to our downstairs living room when my husband gets home :) Thanks for the ideas on accessorizing. wow, I really love console tables. 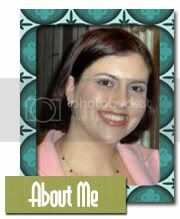 I think I am a symmetrical gal! esp like the look with stools below them! I want a console table. Two minutes ago I didn't. But now I do. What great images. We love them all. I seriously need to take notes. I feel my tablescaping abilities are one of my weakest design skills. Such an informative post! This will be a good reference and I know I will come back to it. I love how you broke it down by the different designers - it was really well thought out! Thank you again for your lantern suggestions. Seriously! I loved all the suggestions and I am so excited. I'll keep you posted on what I (finally) decide. Thank you again! Symmetry appears to be the one rule of thumb. Some great ideas! I have an awkward space downstairs and I think one of these arrangements might be just the ticket. This is a great post, Averill. I tend to automatically go symmetrical but am trying to force myself to mix it up a bit these days. This is a great post. Like MLHP, my tablescaping isn't my strongest suit. I can get the job done but it takes me forever. I love all of the images and esp. love the Hillary Thomas and Sally Steponkus. A great roundup and analysis. I'm sure you noticed all the Chinoiserie! Some really beautiful examples. I fell in love with the one with Hermes boxes the first time I saw it. I know its probably all styling but I just love the way it looks. 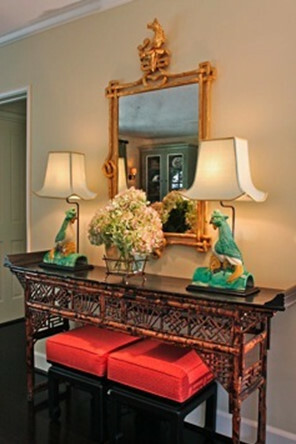 I have a longing to place matching lamps on either end of my console table, but there isn't an outlet nearby. It might look a little funny having chords just hanging down! These are great tips and such pretty inspiration photos. We don't have a console table, but rather a bookcase that kind of functions as one. It's due for a redesign, but I just need to figure out where to put most of the picture frames that are on it before I look for new pieces. Amazing collection of images and a great breakdown on how to do in our own space. Loved this post! You've inspired me Averill to work on my finishing touches on my personal entry table. I often lack in that area, letting go before I finish with those last perfect pieces. You gave us great examples and stellar advice. Hope you had a lovely weekend. So happy to see the sun @ last.